When it comes to adding an eCommerce store to your existing WordPress site WooCommerce has made a plug-in that makes it essentially painless. WooCommerce is the best free ecommerce solution for WordPress users when you want to add a virtual store front to your website. 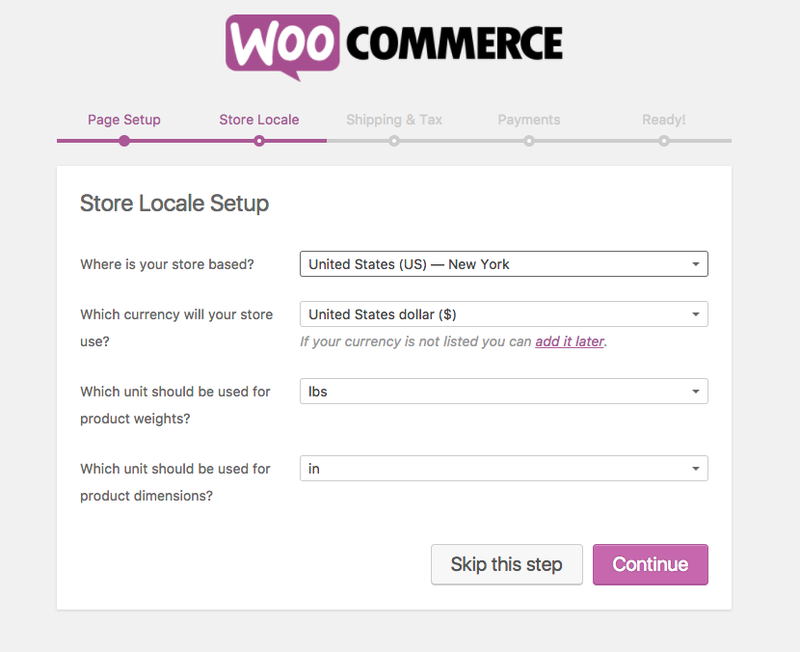 We’ll tell you how to get and add the WooCommerce plugin to your site. You’ll have your ecommerce store up and running in no time flat. The WooCommerce plugin allows you to add and sell anything from your WordPress site. It has visual appeal and is very complex for all your selling, shipping and payment needs. We know you’ll be pleased with the WooCommerce plugin because it displays your virtual or physical items beautifully. You have complete control over your virtual store from design to settings. 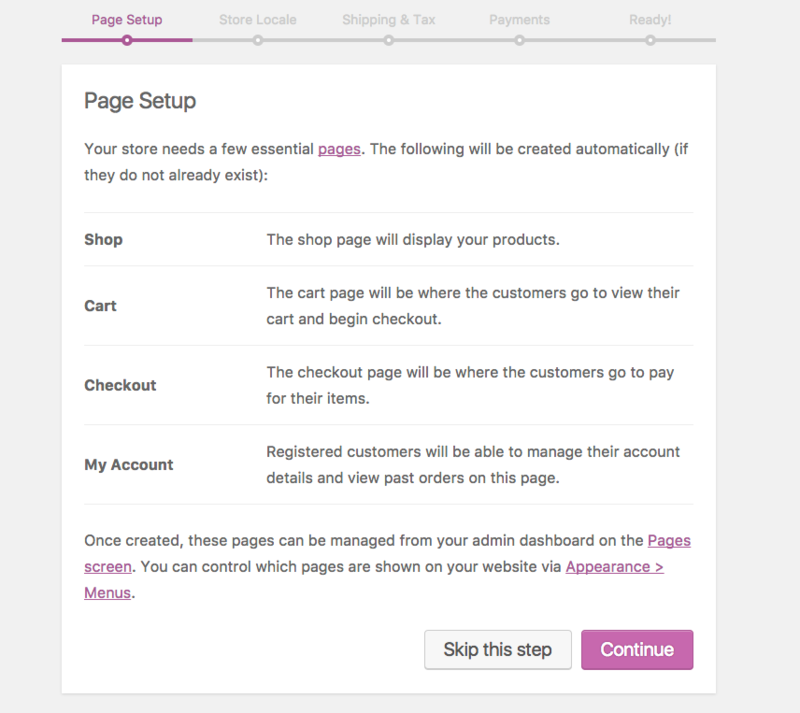 As well as the ability to add and remove extensions that work in conjunction with the WooCommerce plugin. And you won’t need to worry about security issues because WooCommerce has a dedicated development team on hand 24/7 to address any bugs and security risks immediately. 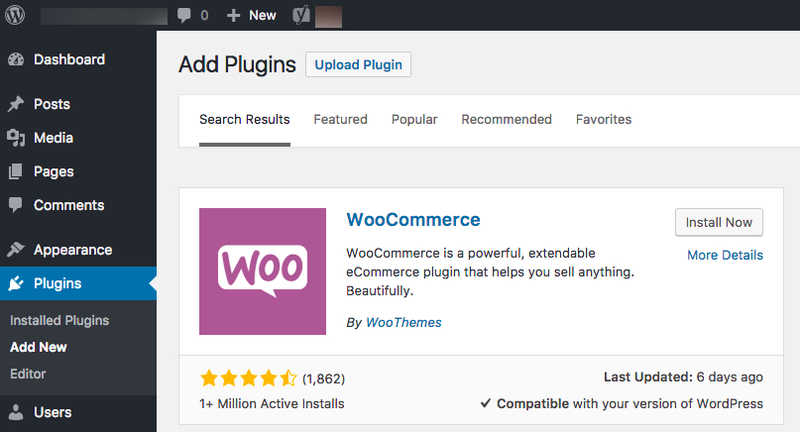 The WooCommerce plugin can be easily installed right from the WordPress Dashboard. Go to the Plugins option in the left hand panel of your WordPress dashboard. Then, click the “add new” button and in the search box type WooCommerce. The first item in the list is the WooCommerce ecommerce plugin. Next, click install now to add the plugin to your WordPress site. Now the plugin is installed. So, click on the activate button and set things up. 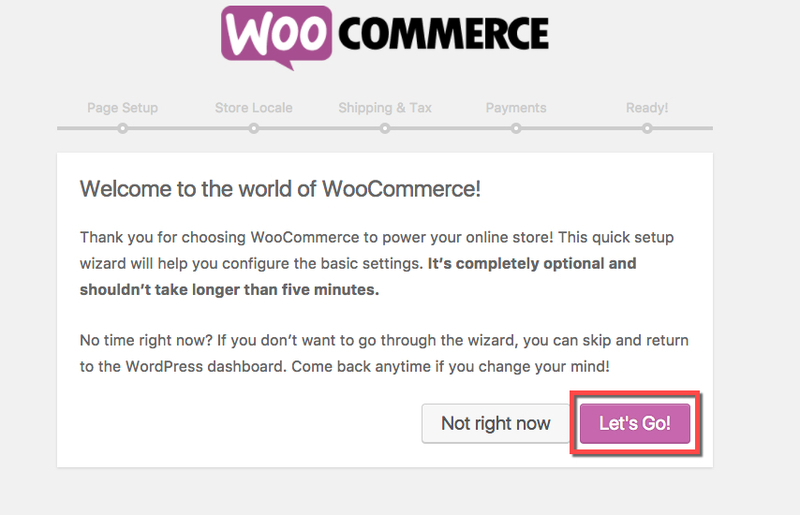 You are now in the WooCommerce Setup wizard. Click on the Let’s Go button. This will the setup process under way. Next, the essential pages you’ll need such as shop, cart, checkout and My account for customers becomes created. Simply click the continue button. Then, on the next page of setup you’re going to select your store locale, currency used, unit for weight and product dimensions. Once you’ve completed that click the continue button. On the next page you’ll check off whether you’re charging sales tax or not and if you’ll be shipping physical goods to your customers. When you’ve completed that part of setup click the continue button to proceed. 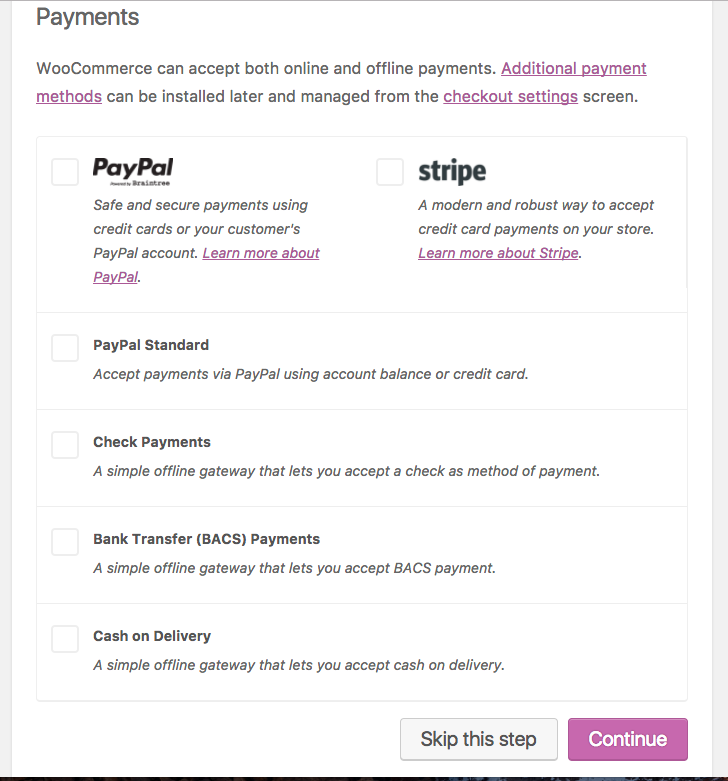 Then, finally setup the ways you’d like to receive payments from your customers. Then, click the continue button one last time. That’s it, you’re WooCommerce Storefront is all setup and ready to use. Now keep in mind that the WooCommerce plugin can work with any WordPress theme but you may need to tinker with stylizing it to obtain the best viewing and purchasing experience for your customers. If you’re not feeling like you want to mess with the code of your WordPress theme. Then, we’d recommend using a Theme specifically designed with the WooCommerce experience in mind. The following WordPress themes are optimized for ecommerce websites. 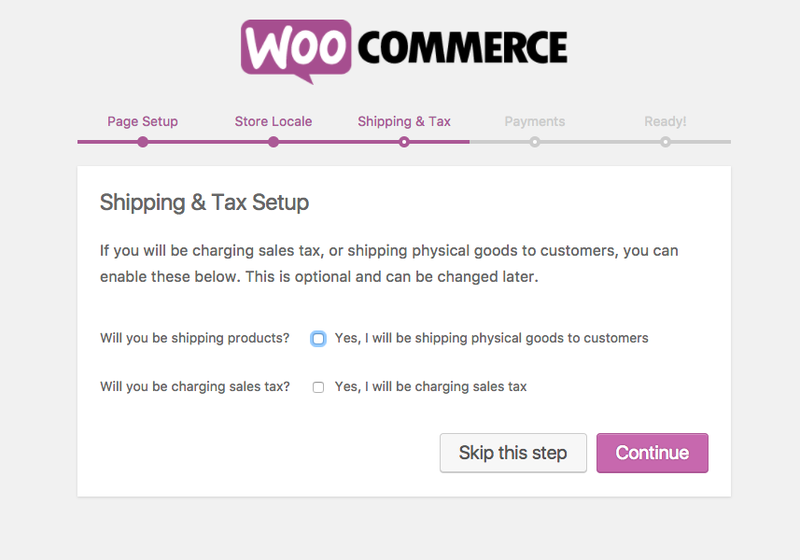 Also they come with WooCommerce functionality built into them already. This could be a really wise route to take if you’re not development savvy. When you are looking for a site to be functional as an online store and work to bring in customers, you’ll want to invest in a premium theme like Shopkeeper. It’s a fully customizable and responsive theme. Pleasing to the eye and very user friendly. The $59 you invest now will be worth it once your orders start rolling in. Do you like drag and drop sort of programs? Then, you’ll really like the responsiveness and unlimited customizations available with Bronx. It’s clean, simply and delightful to view and use. You’ll have the customer’s attention from the moment you set this WordPress theme up. There’s a reason this one’s called the Gem. It’s overflowing with extras. It’s made for the creative within. The Gem is used for multiple types of eCommerce websites. This responsive and SEO optimized theme is made for especially for high traffic eCommerce sites. It’s a very flexible WooCommerce WordPress theme and it comes optimized for selling. Are you more of minimalist? Then, the Arum shopping theme is for you. Even though the theme takes a minimal approach, what you get is stunning. It’s guaranteed your customers get a positive experience using your shop. Aurum is nothing short of amazing. The whole process is smooth from putting items into the cart to checking out. The Business Hub theme is for selling digital products. It comes with the easy digital downloads plugin. So, when you’re looking to sell e-books, design work, apps and programs then, this is the theme you need for your online shop. It’s responsive and your customers will receive their digital goods safely and securely. These five WooCommerce WordPress themes are all priced well. You’ll get everything needed for your online store. They also include support, updates and come quality assured from professionals. So, you know you’re getting a quality product as well as your moneys worth. WooCommerce is one of the most used and trusted ecommerce platforms. You’ll certainly do right using it for opening up shop online. It’s developer supported and is always evolving. What that means for you and your online business is that it’s highly unlikely that it’ll disappear over night and you’ll continue to get updates and on going support. When choosing an ecommerce theme you’ll have to decide how much customization and control you need over features. It’s also gong to depend on whether you need a premium theme with support or a free theme to learn on your own. If it’s not in the budget to pay then, their are a significant amount of free options available to you. Whatever you decide, starting an ecommerce store online is much easier with help from the WooCommerce plugin. It’s flexibility and the fact that it’s free is a major perk. You as a store owner gain compete control over everything about your ecommerce site. You’ll have the opportunity to add or remove extensions as needed by using the WooCommerce plugin. The final decision is yours to make but the easiest way to setup and remain in control of your storefront online with never ending possibilities is to integrate the WooCommerce WordPress plugin into your site. This just our opinion but why make things harder on yourself?